Mosaic is essentially an architectural medium, dating back to the ancient Sumerian era but all too often its true potential is overlooked. Here I look at, what I consider to be, the top five pointers for architects and designers using mosaic. 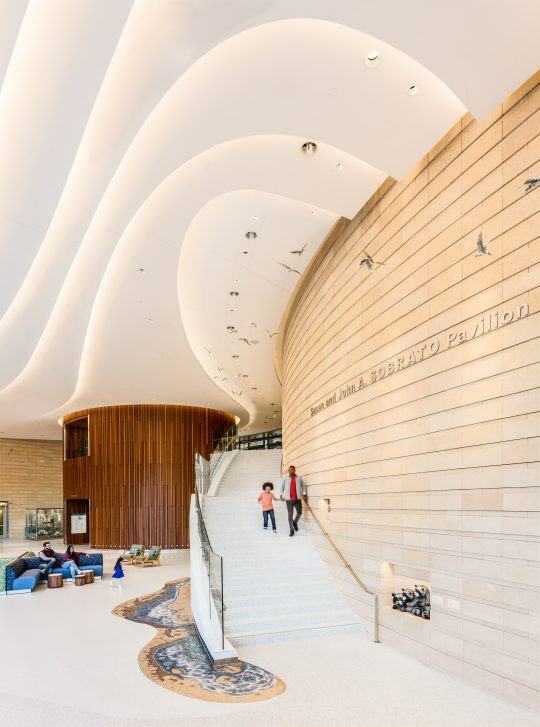 Read these top five pointers for architects and designers using mosaic and discover how you can take full advantage of this beautiful medium. Mosaic is incredibly versatile and it will add enormous potential to your palette alongside the other cladding surface materials and options. Whether you are an architect, interior designer or building manager this list will help you realise your buildings full potential. Unleash your imagination, mosaic is an extremely flexible medium, it can run up walls and across floors, it can bend, twist and curve around any form. Mosaic can bring a new narrative to your space or it can help reveal hidden narratives that are already there. 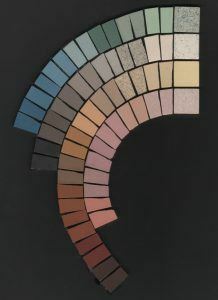 Mosaic can be used to highlight or compliment your buildings colour palette. It can cover a whole wall or floor, or could be a simple meandering line inlayed into another complimentary surface material. 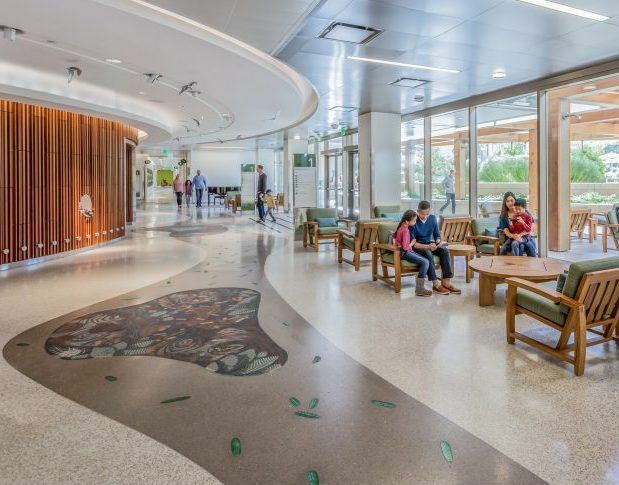 Most people just think of a mosaic in terms of a traditional figurative design image but this is just one aspect of how it can be used and what qualities it can bring to your building. Mosaic is also about light, texture, pattern and colour. The relationship of light to mosaic is both beautiful and complex. The play of light falling across a wall can be reflected, interrupted or absorbed to stunning effect. As the architects of the Byzantine world knew, the rich colours of glass enamels and gold Smalti can capture and reflect the lowest amounts of light. Glass, glazed ceramics, gold and metallic tesserae will sparkle and twinkle. Marbles and porcelain enhance the surface. Of course closely related to light is texture. This quality of mosaic is often overlooked but can be used with great results. 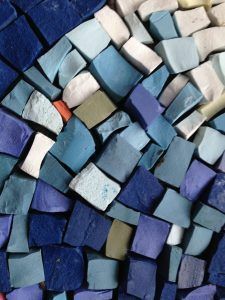 From the glass like polish of a fine marble floor to tesserae deliberately laid at angles or at differing levels, the surface of mosaic can take many forms. Mosaic texture will change as the ambient light changes, alternatively it can be lit to accentuate the texture of the mosaic. Because art mosaics are laid by hand this texture can be controlled to also give flow and direction. Pattern is the core of mosaics identity. 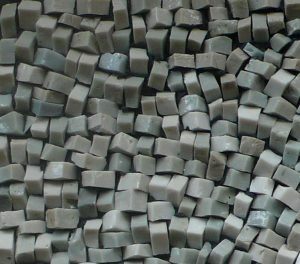 This can range from the simple repeated cube, the essence of all mosaic, to highly complex patterns. 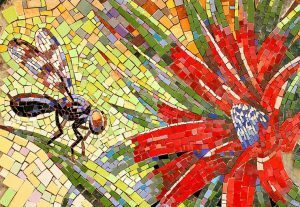 The patterns that mosaics form are a key part of their beauty and draw viewers in as they marvel at the complexity of the work involved. Pattern also can be used to help give cultural significance and identity to a space. 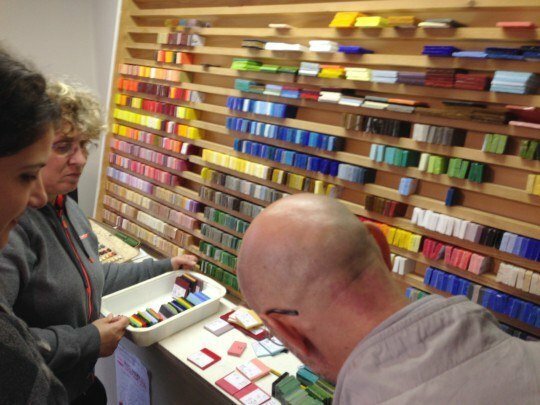 Colour has always been a factor to consider in architecture and mosaic offers not only a rich and diverse palette but also the purest colour. 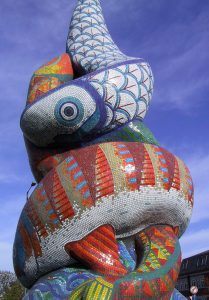 Colour is used in a unique way in mosaic. 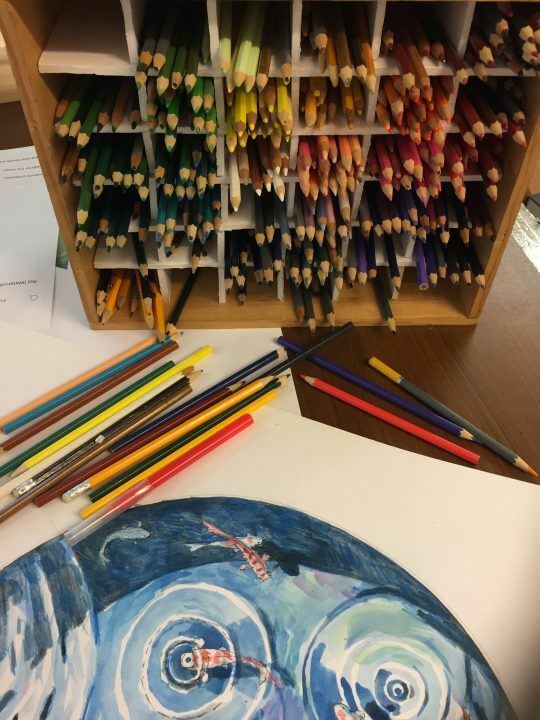 The mosaic artist uses pure colour with each tesserae, and this combining of pure colour and the relationships between colours give a vivid feeling of life to the surface. From bright vivid colours to subtle earth hues mosaic can give a quality colour surface to your building. 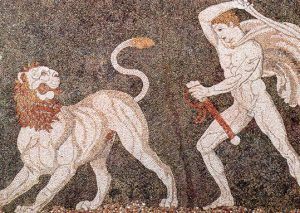 It may sound obvious here but too many mosaics end up being little more than a ‘gallery painting’ hanging on the wall. Don’t miss the opportunity to fully integrate your mosaic into the building. 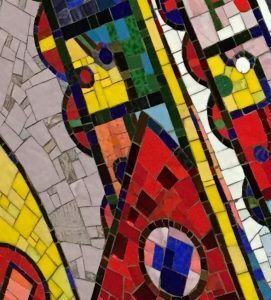 A good mosaic artist will be able to collaborate with the architect to ensure that the design and the technical specification work harmoniously with your building. This integration can also reflect any story or thematic scheme of your building. Obviously floor mosaics need to be flat and level with their surroundings, but wall mosaics too benefit from being flush with the wall surface. 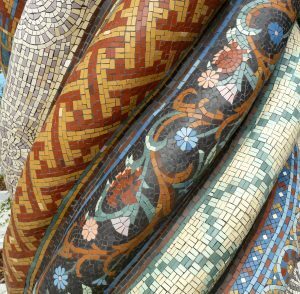 I like to think of mosaic as like an exquisite piece of jewellery, it can enhance and highlight the essence of your buildings design. A tall thin wall mosaic can accentuate the height of a lobby or light well, it can even reflect the light source. 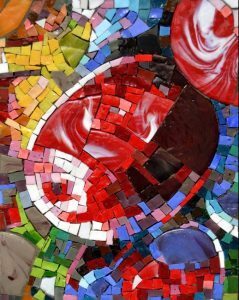 A good mosaic will enhance the space and add a focal point of interest that compliments the space. Traditionally Smalti is used in small cubes approximately 180mm x 10mm x 80mm but it can also be used in larger plate pieces as seen here in our panels for the Paolozzi Mosaics at Tottenham Court Road Underground Station in central London. Litovi’s colour palette is much wider than other porcelains and it is designed to be cut with the mosaic makers hammer to give a vibrant and dynamic textured finish. Perhaps the most ancient floor surface, pebble floors like this one discovered in Pella in Macedonian Greece show how sophisticated mosaics had already become by the fourth century BC. 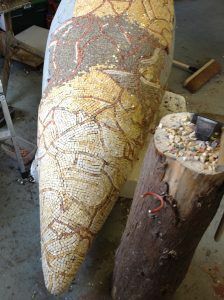 If you are considering using mosaic in your project then start talking to a mosaic artist at the earliest opportunity. Consulting early has a number of benefits: Talking to an experienced mosaic artist can highlight alternative preferred design options before it’s too late to change; and by consulting early the optimum preparation can be planned to ensure an efficient timetable and seamless installation. Items to consider will include: Foundation and site preparation; lighting for the mosaic if needed; maintenance implications; fabrication timetable; installation timetable. 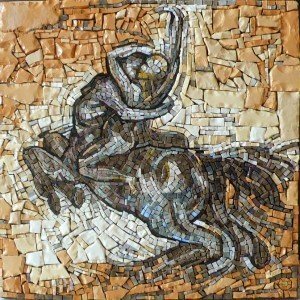 A good mosaic artist will be able to advise on all of these aspects.